Value, Reality, and Desire is an extended argument for a robust realism about value. The robust realist affirms the following distinctive theses. There are genuine claims about value which are true or false - there are facts about value. These value-facts are mind-independent - they are not reducible to desires or other mental states, or indeed to any non-mental facts of a non-evaluative kind. And these genuine, mind-independent, irreducible value-facts arecausally efficacious. Values, quite literally, affect us. These are not particularly fashionable theses, and taken as a whole they go somewhat against the grain of quite a lot of recent work in the metaphysics of value. 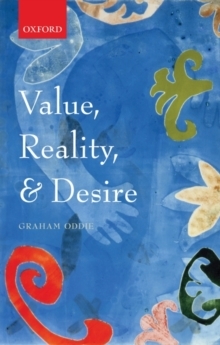 Further, against the received view, Oddie argues that we can have knowledge of values by experiential acquaintance, that there are experiences of value which can be both veridical and appropriately responsive to the values themselves. Finally, these value-experiences are not the products of some exotic and implausible faculty of'intuition'. Rather, they are perfectly mundane and familiar mental states - namely, desires. This view explains how values can be 'intrinsically motivating', without falling foul of the widely accepted 'queerness' objection. There are, of course, other objections to each of the realist's claims. Inshowing how and why these objections fail, Oddie introduces a wealth of interesting and original insights about issues of wider interest - including the nature of properties, reduction, supervenience, and causation. The result is a novel and interesting account which illuminates what would otherwise be deeply puzzling features of value and desire and the connections between them.